The history of the Edison Ballroom is extensive and illustrious. It originally opened in the 1930’s as the grand ballroom for the Hotel Edison. It was constructed in a classic art deco motif and offered dining and dancing to its patrons. It featured many famous bands and singers from the Swing era. A generation later, the ballroom was converted to the Edison Theater, where various Broadway theatrical productions were offered including “Oh! Calcutta!” which ran for a record 13 years. In 1991, the Edison Theater was converted to the famous Supper Club, which offered dinner and dancing to the music of many “big-band” style orchestras. The venue was also utilized by a vast array of entertainers for intimate concerts and performances. Music icons including Herbie Hancock, Bob Dylan, Rod Stewart, Elvis Costello, David Bowie, Tony Bennett, Jon Bon Jovi and Eddie Fisher all performed on the Supper Club’s stage. 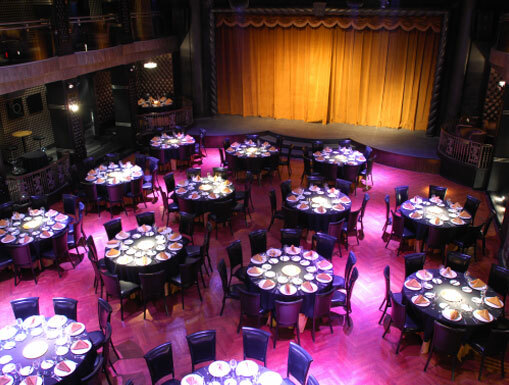 In 2007, the Edison Ballroom took center stage and re-opened as an elegant and upscale Manhattan venue. The unique architectural style paired with its long history and Times Square location, makes the Edison Ballroom a breath of fresh air for the New York City event scene. Owner Allan Wartski owns several other venues in New York including Christo’s Steakhouse in Astoria, Queens and the Cosmopolitan Hotel in TriBeCa. Located at 240 West 47th Street with over 16,000 square feet of impeccably designed space, the ballroom is an art deco haven with a modern flair. It has played host to a wide variety of events including fundraisers and fashion shows. Events that are open to the public like the one I attended, Joe Battaglia and The New York Big Band are priced in an all inclusive format. Tickets for dinner and dancing are $125.00 per person and include all food, all drinks (fully stocked bar) and gratuities. Additionally, they open their doors to other guests from 10:30 pm to 1:00 am for a general admission price of $45.00 per person, which includes drinks, hors d’oeuvres, gratuities and dancing. The Edison Ballroom offers a gorgeous backdrop for charity galas, concerts, Broadway openings, photo and video shoots and much more. The beautiful décor and impeccable service make it my venue of choice in Manhattan.